With An Ax To Grind the second album of this quartet from Pennsylvania is ready. It’s only been 12 months since they re-released their debut-album Out Of Ashes, Into The Fire… And Other Tales Of Insanity. 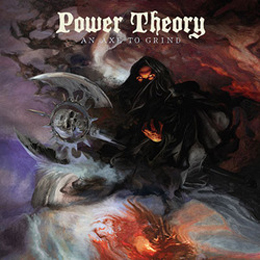 Power Theory is an band who’s playing rocking metal with certain Saxon- influences, while the raw vocals remind mor on ex Metal- Church- frontman David Wayne. Classic metal- riffing and nice twin- leads are combined with thrashy elements. Some highlights on the record are “Pure Steel” with its midtempo groove. The Warrior cover is a picture painted by Eliran Kantor, who also painted the covers of legends like Sodom (In War And Pieces) and Testament’s The Formation Of Damnation. People who like thrash metal like Testament has to check out this band.